I was half-awakened this morning by the sound of a helicopter (which mingled with the sound of workmen taking down scaffolding across the street and someone hammering incessantly next door - it wasn’t a particularly restful morning). I was fully awakened by Jeremy jumping up to answer the phone a little while later. His side of the conversation went something like this: “Hi Tim…no…oh no, you’re kidding…no way…no…okay, thanks for letting me know…” My first sleepy, dreadful thought was that something bad had happened to someone Jeremy works with. Times being what they are, my second thought was that a nuclear bomb had gone off somewhere (maybe it’s the war, maybe I’ve just been watching too much 24). As it turned out, the news was that the West Pier was on fire. In the greater scheme of things (see nuclear bomb fear above), this isn’t such a big deal. But if you’ve been reading this site for a while, you’ll know that 1) the West Pier is my favorite bit of architecture in Brighton, 2) I have been fretting about the potential loss of the pier for ages now, and 3) Brighton has had some seriously bad luck with its piers in the past three months (two partial collapses of the West Pier, and one fire on the other pier). Not many things could induce me to jump out of bed, get dressed immediately and leave the house without having had a cup of coffee. 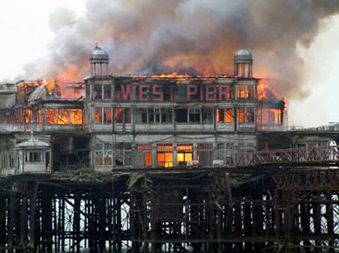 But a fire on my poor, lovely, beleaguered West Pier certainly could. So Jeremy and I trundled out in mess of digital cameras and sunglasses, and we headed for the beach. I was quite shocked when we got there. The pier was just a smoldering shell, and the starlings that had formerly made their home there were circling around forlornly in the smoke pouring from what was left of the building. I think what made me the most upset was seeing that the “West Pier” sign on the front of the building - which used to be half-illuminated at night in a ghostly red glow, and which is still visible in the picture below - was completely gone. Everything was gone. All that remained was the bare skeleton of the grand old building - and as I watched, even bits of that were tumbling off and falling into the filthy brown water around the end of the pier. It was heartbreaking. On a happier note, the helicopter that had initially awakened me (a Coast Guard helicopter, as it turned out) was still flying around monitoring things, and just as we were getting ready to head back to the house for some much-needed coffee, the helicopter came in and landed on the stony beach not a hundred feet away from us. Ever since flying over glaciers in a helicopter in Alaska - one of the most thrilling things I’ve ever experienced in my life - I have had a real “thing” for helicopters. If they weren’t so difficult to fly, I’d even consider taking lessons (well, maybe…). Anyway, seeing this massive helicopter come in to land so close to me, with the downdraft from its rotors whipping up the water into a froth, was certainly the highlight of my day. When a brave coastal firefighter/rescue guy jumped out of the ‘copter, I felt like clapping. And then, times being what they are, I was struck by the thought of other helicopters in dusty, faraway lands, and I didn’t really feel like clapping anymore. And leaving the smoldering wreck of my favorite bit of Brighton behind me, I trudged back home again. Coda: Thanks to Tim at Motionpath for the great photo below. Jeremy has more pier photos up on his site. I simply cannot believe that this has happened…how very, very sad. It's a UFO! It's a meteorite! It's...a cat.